The Powerloo is supposed to be an environmentally friendly way to dispose of dog poop. It’s an outdoor toilet that’s connected to your sewer and water lines for flushing poop you’ve scooped from your yard or poop you pick up on your walks in biodegradable bags. It comes in 6 different colors and will be $1000. Kind of pricey, hunh? I’m not sure how the amount of water used balances out against keeping plastic bags out of landfills. There’s another flusher thingy called The Wasteaway. 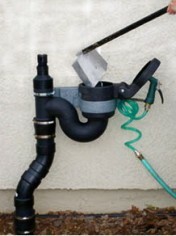 It attaches at the clean-out pipe for your sewer line and uses a mounted garden hose to flush the poop. The opening looks kind of small—that could get really gross really quickly if your aim is bad. At least you can control how much water is used. The Wasteaway isn’t as pretty as the Powerloo, but it’s a lot cheaper at $175.